IT’S inconceivable to me, my dears, that there’s so much Konkani and Marathi passion (chauvinism?) in amche bhangarechem Goem! Forget Marathi, I don’t understand why anyone would want Marathi mausi (doosri avoi or stepmother more like it) to rule in Goa long after liberation, statehood and opinion poll. Marathi is for Maharashtra just as Konkani is for Goa. Be it in Devnagiri and/or Romi alphabet – both these scripts have a bona fide right to co-exist in Goa, what with Hindu Goa steeped in Devnagiri (courtesy Marathi) and Catholic Goa in the Romi or English alphabet. I think Romi Konkani and Catholic Goa have done much more to preserve Konkani from suffering and dying out during Portuguese colonial rule in several ways even though Portuguese was the language of education for the privileged then as English is today. If you read Snehalata Bhatikar’s new book of her memories of growing up in a joint Gaud Saraswat Brahmin (GSB) family speaking and writing shudh Konkani in Ribandar (or ‘Raiban’ as she calls it in the original lingo), you will get an idea of how language can be such a driving force and how it can be marginalised so rudely. NOW that was a rather charming book release they had at the old-world Mandovi Hotel in Panjim on Sunday, October 1, never mind that it was also like a general body meeting of the niche GSB community in Goa. Graceful Konkani writer Hema Naik (I like her!) did the honours of introducing and reading bits from the book, praising Snehalata for her keen insight into what life was all about when she was a young girl growing up into a young woman. I’m no good, my dears, at either speaking or reading Konkani and will wait for this book to be translated into English by Sahitya Akademi or someone else. The gist of it is seductive. Snehalata, or Lata, doesn’t sympathise with me and says ‘please learn Konkani’ to read her book! Hema Naik raised an important question: “If folk in Goa don’t want to talk in Konkani, when will they ever get down to reading it?” Education begins at home. A whole lot of familiar crème de la crème were present with everyone more or less holding forth. Fomento group chairperson Auduth Timblo struggled to cut the Gordian knot of the new book (don’t know why books have to be so tightly parcelled in knots like it is a metaphor for life) and rebel RSS leader Subhash Velingkar, of the newly formed Goa Suraksha Manch party which is creating such a political storm these pre-election days, praised the author for all the efforts she has put into painting a vivid picture of village life once upon a time. Raiban or ‘Raj Bhandar’, today’s Ribandar, used to be a wealthy enclave for Hindu GSB families and Catholic nobility Portuguese or Goan. 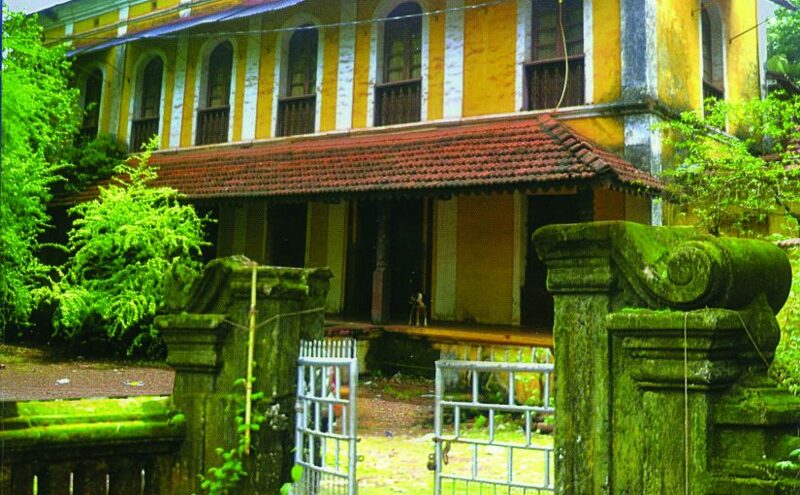 Remember Casa Dos Colaco which still stands grandly at Ribandar is older than Buckingham Palace in London (my friend Fernanda Colaco, wife to Margao’s Dr Francisco Colaco, grew up in this huge rambling mansion and has many memories of a different kind presumably. A pity she sold off her old home later on)! Auduth Timblo was impressed and said the book has shades of Harper Lee’s Pulitzer prize-winning book ‘To Kill A Mockingbird’ (about the petty power and pelf of small-town Americana seen through the eyes of a 10-year-old girl and considered a modern American classic). With Lata’s ‘Majhe Raiban, Ti Mansha, To Kaal’, I dare such memoirs in Konkani are far and few between. Lata is an experienced counsellor who knows a great deal about what goes wrong between children and parents. Her previous book ‘Mothering & Smothering’ (2008) in English ought to be of interest to parents and teachers alike. She was in an ebullient mood for this was an occasion when old students and a lot of friends and relatives wanted to catchup with old nostalgia. There’s not a word of English in the book, even the print line is in Konkani, and the price is `200! It’s published by Yugved Prakashan and everyone got a free copy at the function; you may find it at local bookstores which keep Konkani publications, or call up Lata or hubby Arvind Bhatikar, a key member of the Goa Suraksha Manch party. He also edits the Konkani daily of Prudent Media which recently celebrated its 10th birthday, and the English daily ‘The Goan’ which belongs to the Timblo media group. Well then, it’s avjo, poiteverem, selamat datang, au revoir, arrivederci and vachun yeta here for now.